A festive greetings to all you demo coders our there! In my home town spring is finally starting to arrive ... and the relentless winter chill is easing up. Finally the temperature is rising above -20'c for the first time since November. This "thaw" reminds me that summer is around the corner. Finally we can start looking forward to the summer demo parties of 2005! During the last issue I asked you to vote for the content of the next tutorial. I got some great correspondence from a student in Portugal. He's having a blast playing and learning Allegro, and appreciates the focus on "free tools and compilers". Free tools really fit his tight student budget. He's requested a tutorial on magnifying lenses, so I'm happy to put the other tutorial series temporarily on hold to explore how to create a magnifying lens effect. I realize this tutorial "jumps right" into some things... but take your time with it. It might not be entirely understood overnight – but with some effort it should be clear. As always if you have any specific questions – I'm just an email away. Lens Physics 101 – What is a lens? The first thing we need to do to code a lens effect is to get a basic understanding of what lenses are and how they work. The effect we are trying to reproduce is convex lens; just like a standard magnifying glass. You can see the effect in the screen capture. 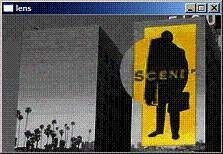 The word "scene" is magnified by the virtual lens. This tutorial will teach you how to make that lens. I need to stress something very important. We are not attempting to fully model physical reality – only a perception of it. Our simulation does not need to be physically accurate. It needs only to "look right". There are many ways to simulate a lens, and I'm sure that the one that I describe here isn't orthodox. I developed it from the ground up and it's far simpler to understand and describe than a number of other lens tutorials. It's also reasonably flexible. The most important piece of the article isn't so much "the lens" but the speed optimizations we make at the end of the tutorial to speed up the effect. The basic magnifying effect is caused by light refracting with a lens. Light rays get refracted (bent) by the lens and converge on a single point. This point is also known as the "focal point" of the lens. Whenever someone ignites something (like paper) with a magnifying lens – they are taking advantage of the focal point. All the light rays that intersect with the lens converge and heat up the small focal point to the point of burning. Each lens has a different focal point, which results in different powers of magnification. Many lens systems call this the "Magnification factor" as altering it changes the degree of magnification. The distance between the lens focal point and the lens is known as the focal length. This is summarized in figure 1.0. So far, all these definitions have focused on light traveling towards the focal point. When a magnifying glass is used - the object for magnification is placed between the lens and the focal point. Light travels from the object to the lens and then into the eye. To generate a simple lens effect however, we can imagine the light traveling in the same fashion as we've already described. Figure 1.0 shows a "side view", with the Z axis (left to right) and the Y axis (up and down). This is actually all we really need know to do this effect. If you hold a lens in front of you – looking towards the Z axis – rotations along the Z axis don't affect the image. [In other words there is no way to hold a lens "upside down"]. If we are able to solve equations for our side image - in terms of Height and Depth (Y and Z) - we have also solved for X because we can treat X the same exact way. For our simulation there are a few constants we will consider as known. 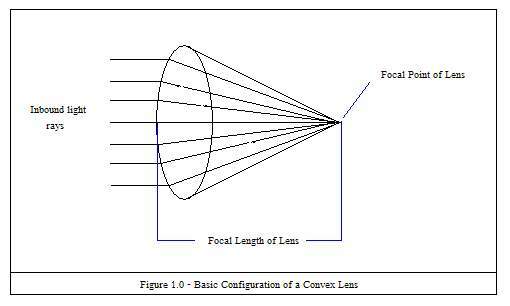 Let us call the distance from the bottom of the lens to the top of the lens the "lens diameter" (see Figure 3.0). When we apply the effect onto the computer screen – we'll consider the lens to be applied to the square occupying the area of Lens_Diameter x Lens_Diameter (in pixels). We'll simply drop out any points outside of the "lens", but are still in the area of square [Lens_Diameter x Lens_Diameter]. (Shown in red). 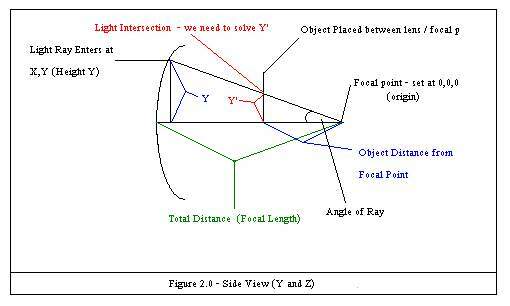 We also know the focal length of the lens, and for simplicity can consider the focal point to be at the origin of the coordinate system. Similarly, the distance between the object placement and the focal length is a constant of our simulation – known as "object_d" – object distance. We render our lens by looping across the lens surface (diameter), in two loops. This appears in the following pseudo code. // find out where the light ray intersects the object . Now the pseudo code is a bit naive (for example it doesn't take into account screen coordinates), vrs "lens coordinates". However from that pseudo code... you can see that the only thing we really need to know is what the projected X and projected Y are for a given X,Y. Once we know that - We've solved the magnification equation. Figure 2.0 shows what we need to solve. We know the focal length of the lens, and the distance of the object between the lens and the focal point. We also know Y – the height of the light ray as it enters the lens. What we need to solve is Y'. Y' is the height of refracted light ray where the light intersects our magnified object. I've seen lots of tutorials that show how to solve this, and only a few use trigonometry. Most rely heavily on the Pythagorean theorem. I realize that some people might avoid trigonometry based on its computation speed.. and that's rightly so. However – it's possible to almost completely pre-calculate the lens with optimization. In my opinion – a bit of trigonometry at the initialization phase of the program isn't anything to be worried about. When examining Figure 2.0 you might notice that the triangle formed by the line segment Y (with the other two line segments going to origin) is similar to the triangle formed by Y' (and the other two line segments going to origin). In fact – the angle "angle of ray" is shared by these two triangles. If we know the angle, Y' can be calculated as follows. TAN(Angle) =(Y' / Object Distance). Y' = TAN(Angle) * Object Distance. Still, we need to find out the angle in order calculate Y'. You might notice that the focal length of the lens – is also the length of the line segment from the light ray entering the lens to the focal point. We also know the value of Y. From these two we know that SIN(angle)=(Y/Focal Length). Taking the inverse sign – we can solve for the angle = asin(y/focal_length). (Remember asin is simply the inverse sin). Wow! At this point we can know that Y'=tan(asin(Y/R))*object_d, and can compute Y' in a program. Part #1 – Rendering The Lens – 6 Steps to Lens! Anyone that has been following the tutorials will have a lot of familiarity in setting Allegro up and making a basic framework. If you don't, go back to previous chapter and read! Since this is review for most people, I've created a "basic" framework to start with. Take lens.a.rar from the bonus pack, and open it up. You'll notice it also includes a pcx image we'll use in this part of the of the tutorial. The only thing that's a little different with this framework from code we've already used – is that it initializes the mouse (as we'll be using the mouse later on). Now that we've got the framework installed – we need to start coding our effect. Here is a step by step guide. 2. Next up – we'll add our function to draw the lens. I'll go over the function in detail – but for now... place this into the code. It should already be making some sense to you. // yeah! we are in the "lens circle"
4. At the point of // init more stuff (next phase) – we need to load our background, and set the palette. We'll also apply the effect to the screen [once]. Because we aren't doing any double buffering yet – the effect would "flicker" too badly for us to see it if we updated in the render loop. // The last line – draws a simple lens at 110,50 of the screen. 6. We've allocated a bitmap to hold the background. We also need to de-allocate it. If everything worked correctly – you should be able to run the application and enjoy your lens effect as the screen shot shows. Over all the simple lens procedure should make sense, however there are a few things that I haven't yet explained that might be a bit confusing. Let's start with the basics. So, we loop against the lens surface in X and Y. Inside the inner loop we have to determine if the point X,Y is actually inside our lens. Points outside the lens are in coloured in red in Figure 3.0, and are dropped out of the equation. This is the only spot of our system where we make use of the Pythagorean theorem. Consult figure 4.0 to better understand this. 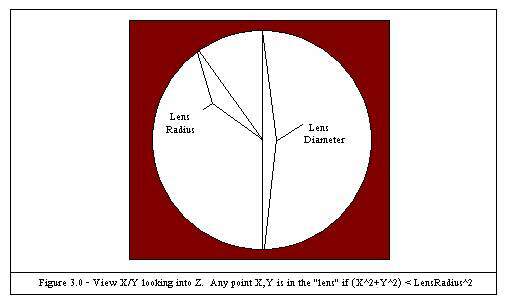 Remember – our coordinate system is centered with the lens center being <x = 0, y = 0>. Our circle has a radius of one half the diameter. If point X,Y in question is further from the center than the length of circle radius – it's outside the circle. The Pythagorean theorem states that the hypotenuse squared is equal to the sum of the other two segments squared (for a right triangle). This means that (Distance to X,Y)^2 = (Y Distance)^2+(X Distance)^2. (Where ^2 means "squared".) We can calculate the distance to X,Y by taking the square root(x^2, y^2). A point is in the circle if square root(x^2, y^2) < radius. Now you might be confused by the code. We aren't using square root, instead it is: "if (x*x + y*y<lens_radius*lens_radius)". This is strictly a speed optimization. Since square roots are expensive, we simply square either side of the relationship. We loose the square root, and compare it against the square of the radius. This is simply an application of the formula we derived in "Lens Physics 102 – Solving the Lens Equation", Y'=tan(asin(Y/R))*object_d. P_x and P_y are still in pure Cartesian coordinates. Now that we have calculated "where" the projected X and Y land – we need to look up the colour in the background bitmap. Here is where we have to convert to screen coordinates. Let's compare with our lens coordinate system to screen coordinates. Remember: Our lens starts at Lens_X, Lens_Y (at upper left, not the middle of the lens). We feed Lens_X and Lens_Y into our calculations to allow us to move the lens on the screen. Our Y loop starts at the bottom of the lens, and moves to the top. Y gradually moves from being negative at the bottom of the lens – to growing positive at the top of the lens. This is proper for the pure Cartesian system – but it's reverse from how we do screen coordinates. 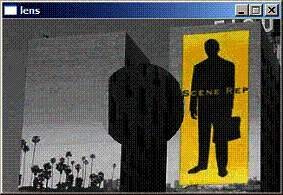 In screen coordinates – the bottom is larger than the top. We have to compensate for this when we convert Cartesian coordinates to screen coordinates. We do this by flipping our Y value (taking the negative) – and adding the lens radius. Adding the lens radius offsets the Y value so it isn't negative. Formula A. ScreenY= -lens_ cartesian_y+lens_radius+lens_y. (complete formula). At this point the rest of the code should make complete sense. We look up the pixel at p_x and p_y, by using _getpixel against the background image we are magnifying. You can see the application of Formula A and Formula B – to pass in true screen coordinates. The same formulas are used to put the pixel on screen. Voila! There is still much to do for a really cool lens effect. Let's keep coding! In order to animate the lens following the mouse, we'll have to poll the mouse, and use double buffering [or it will flicker badly]. Let's add these features step by step. 1. Add the off screen buffer with the other global bitmap declarations. 2. Rename draw_simple_lens to draw_lens (so we don't confuse it with the other version). 3. Alter the putpixel in draw_lens to go to off_screen instead of screen. (Rendering to the double buffer). 4. In the init phase we'll need to create the double buffer and delete it. In addition we'll want to restrict the mouse movement so we can move the lens outside the boundary of what's possible. Our init phase ends up looking like this (notice the removal of the call to blit / draw lens – we'll add those into the main render loop). 5. In the main loop – we'll blit the background to the double buffer, apply the lens, and then blit it to the screen. We'll also use the mouse instead of static x/y position. // DO SOMETHING AMAZING HERE! Voila! We've now added double buffering, and can interactively move the lens around! However – there's plenty more tricks where that came from. Right now our routine is terribly slow. We've got tangents, multiplies, inverse sins... for every single pixel of the lens. There has to be a better way and there is! If you look at the loop – you might notice that our calculations for p_x and p_y don't actually ever involve lens_x and lens_y. That code is all the same, right up to the point where we move them into screen coordinates. In fact every iteration of the loop – p_x and p_y are the same each frame, each time. The lens affects the projection the same way no matter where it's at. If it moves a pixel "right" 10 units (from the starting point of the lens), it will do that every single time. This means that we can pre-calculate the lens in an array of transformations – and then apply these transformations when we are running. Doing this saves all the overhead of the somewhat expensive trigonometric functions. For every point of the lens [x,y] – we can figure out how the light is refracted, and store the delta of that value into an array. Then we can simply look up how the lens refracts point X,Y, grab the colour and plot! We don't even need to think about "pure" coordinate systems versus screen coordinates. For example – let's say that X becomes X+5 but that Y stays the same. We can represent that transformation as 5. If x moved 5 points to the left after the transformation – we could represent that as -5. It's like a pirate counting "paces" on a map. Y values can be represented the same way. Imagine if we transformed the point "320 pixels to the right". Well, that falls out of boundary of the 320x200 Mode 13h screen! What if instead of falling out of bounds – we simply wrapped around.. to the start of the next line. Since each line is 320 pixels – a transformation of 320 would result in dropping down to Y+1. Screen coordinates actually use this already. Imagine for a moment if we numbered all the pixels in a 320x200 grid. Starting at 0 at the top left, we'd count pixels from left to right to form the first line of the screen – stopping at the right boundary with pixel 319. If we continued on the next line – we'd encounter pixel 320, and could continue till we hit the edge at 639. In essence – we can linearly enumerate all the pixels in the 320x200 video mode – by assigning an ever increasing number depending on pixel position. (See the table below). If we wanted to find out what linear position a given X and Y on screen are at – we'd calculate linear position = y * 320 (number of pixels per screen row) + x. In this manner if we wanted to represent the transformation of a point Y where Y increases by 5 units (i.e. goes down 5 units) (but X stays the same) – the transformation would be equal to 320*5 or 1600. It's possible for us to represent how a point changes both in X and Y based on one number alone. Video memory [and the bitmaps] are actually represented in this way. (Mode13 bitmaps in allegro anyway). This is not always the case in all video modes, but lucky for us it is for Mode 13h. This means we can really start to optimize our lens effect. Let's get started! 2. We need to now create this "lens_offsets" table. This is actually tightly based on the first lens drawing code. Add this code into your project. We also need a function that draws the lens using the transformation matrix. We call this "draw lens optimized". All that's required to finish up is to create the lens and use the new lens function. Add the call to create the lens at the init phase. At this point you won't see a difference, except for the responsiveness in how the lens will follow the mouse. The code is quite a bit faster. I'll explain in more detail and then we can crank up the optimizations one more "notch". Over all the "create lens" works just as we'd expect. It's very similar to the draw lens from before – but we don't have to take into account Lens_X or Lens_Y. (Starting points of the lens). We are simply calculating the transformation – so we can drop those out of our equation to 0. This might seem a bit confusing at first. The important bit to realize is that as we go down each x,y pair – we are figuring out where on screen that becomes transformed to. Then we can simply add a X and Y offset – to put the lens anywhere. Another neat feature is dealing with circle shape. Points outside the radius of the circle are untransformed. It is however cheaper to plot a pixel instead of doing the test (x^2+y^2 < lens_radius^2). In order to do this we can simply provide a transformation (for the points outside the lens circle) which don't "bend" or "refract" the pixels at all. This makes for a much cleaner loop inside the draw lens function. There are two main bits to the draw lens function. The first part grabs the pixel that's been transformed. Here you can see the basics of the translation to screen coordinates. We access the background bitmap array at the upper left quadrant (0,0) with bkg_bmp->line. We then add the lens_y*320 (screen_x is our screen resolution constant of 320). This shifts our lens down to wherever we've got the mouse pointing. We then add lens_x, moving it to the exact spot we want it with the mouse. But wait! That's not all folks! Part #4 – Final Optimizations: (a.k.a.) I can see clearly now the code is gone! As you can see, we've migrated the un-essentials outside the loop. It's possible to make this even tighter, but it would get confusing for a minimal speed increase. Voila! A complete and fairly optimized lens effect. Not perfect; but nothing ever is! Grab the last version here: lens.e.rar (bonus pack). Well folks, as promised – I respond to reader requests. I haven't decided what's next.. but I'm already looking forward to it. 1. Dive in to wireframe 3d and 3d math explanations? 2. Scrollers 201? Working towards a scroller generation program? 3. Or something completely different?